Watch our NOPHNRCSE video on the link above! 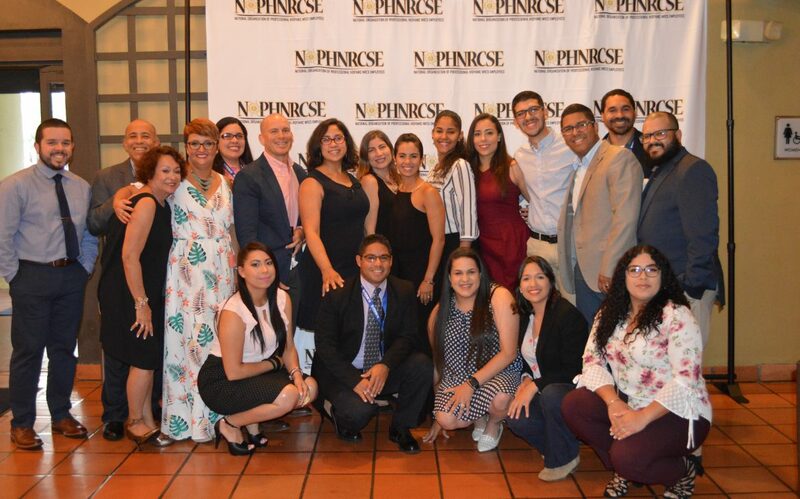 Over the course of 25 years NOPHNRCSE has been working together to serve as an advocacy group for Hispanic employees by starting an outreach effort to recruit potential members. We have been supported as Hispanics and have had guidance on how to achieve leadership positions in our agency keeping in mind our number one commitment of “helping people help the land”. NOPHNRCSE celebrated their 25th anniversary in San Antonio, TX where the first Interim Organization held their conference becoming the National Organization of Professional SCS Employees. Joyful faces, loud laughs and great memories come and go across the lobby of the Double Tree by Hilton Hotel along with Spanish sentences that might end in an English quote, “Spanglish”, a familiar way of having a conversation with a Hispanic colleague. There’s an excitement to see everyone and a week of wonderful things is ahead of us. Coffee and pastries are part of our mornings as we get ready to start our first day of NEDC training; Civil Rights, Managing for Excellence, Working Effectively with Hispanic Producers and Improving Conservation Delivery for Women Landowners and Producers. An opening ceremony for the NOPHNRCSE Conference led Bertha Venegas (NRCS, TX) follows on Friday morning after a week of NEDC trainings. Surrounded by delicious food and great people we are welcomed by Salvador Salinas (Texas State Conservationist), Jeffrey Dziedzic (NEDC Director) and our NOPHNRCSE President, Michael Margo. In memory of our family and friends of Puerto Rico we had Edwin Almodovar (Sate Conservationist, PR) give a presentation of all the recovery efforts that have been a tremendous help in PR and Virgin Island. Sessions on Special Emphasis Program Managers, Career Development/Networking Outreach and Soil Health were offered as part of our conference where approximately 115 employees attended. These trainings provided employees with valuable tools for Agency Program delivery to undeserved communities, a renewed sense of engagement, and ways to translate leadership into their positions. After our morning session followed by an exquisite luncheon, we are now networking, building relationships and gaining confidence. In that subject we all had a unique opportunity to listen to one of our key note speaker Eldonna Lewis Fernandez and learned how her experiences have helped her on gaining a better result through negotiation: “creating a win- win result by understanding the Pitfalls to avoid”. How to think like a leader and a negotiator were the “take home messages” of an amazing speech. We cannot leave the scene without doing our annual salsa class where all the fun and dancing starts, music takes over as you could hear the 1,2,3 and 5,6,7 by the salsa teacher Misha (myself). Yes, it’s very helpful to get your body moving after a long day of training and what a way to get yourself a little loose. First day of NOPHNRCSE session is over, now is time to get our bidding number ready for the auction night to start. Glamorous lights are brightening the hotel conference room, loud conversations through the dinner buffet lines dominate the environment, and curious people come and go silently looking at the items for sale! Finally, the auctioneer grabs the microphone and starts his unique chant, through the night numbers and more numbers kept increasing our scholarship funds all the way until we raised $2,100 plus a donation from the Margo family: Minerva Margo and Sheila Margo Sanchez who donated $2,500 (in honor of NOPHNRCSE’s 25th Anniversary) to support a student scholarship. Ashley Romero, Damuel Morales, Nilda Ruiz and Tiffany Pérez (the 2018 NOPHNRCSE scholarship recipients) where very excited to know how well auction night had gone and how supported they felt by their new NOPHNRCSE family. As the second day of training goes by, employees continue learning from expert instructors on topics ranging from how to identify biases to developing conservation plans that include soil health practices. After all the NOPHNRCSE past presidents shared their testimonials with great advices an amazing PowerPoint put together by Rocemi Morales brought tears to the room. This special presentation included pictures of members sharing how long they’ve been in the organization and why.